The Constant Gardener is a 2005 political thriller film directed by Fernando Meirelles. The screenplay by Jeffrey Caine is based on the John le Carrénovel of the same name. The film follows Justin Quayle (Ralph Fiennes), a British diplomat in Kenya, as he tries to solve the murder of his wife Tessa (Rachel Weisz), an Amnesty activist, alternating with many flashbacks telling the story of their love. The film also stars Hubert Koundé, Danny Huston, Bill Nighy and Donald Sumpter. It was filmed on location in Loiyangalani and the slums of Kibera, a section of Nairobi, Kenya. Circumstances in the area affected the cast and crew to the extent that they set up the Constant Gardener Trust in order to provide basic education for these villages. The plot was vaguely based on areal-life case in Kano, Nigeria. The DVD versions were released in the United States on 1 January 2006 and in the United Kingdom on 13 March 2006. Justin's gentle but diligent attention to his plants is a recurring background theme, from which image the film's title is derived. 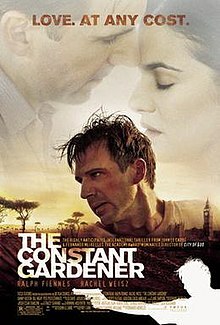 Justin Quayle (Ralph Fiennes), a shy, low-level British diplomat and horticultural hobbyist posted in Kenya, is one to avoid making a fuss until he learns that his wife Tessa (Rachel Weisz) was found dead in the veld. Tessa has been murdered at a crossroads along with her Kenyan driver. Her doctor colleague Arnold Bluhm (Hubert Koundé) is initially suspected of her murder but is later found to have himself been murdered on the same day as Tessa. Various rumours abound that the two were having an affair; however, it is later revealed that Bluhm was gay. In flashbacks, we see how in London, Justin met his future wife Tessa, an outspoken humanitarian and Amnesty activist. He falls in love with her and she persuades him to take her back with him to Kenya. Despite their loving marriage, Tessa keeps from Justin the reason why she approached him in the first place - to investigate a suspicious drug trial in Kenya and expose it. When Tessa starts getting too close to uncovering the malpractices of an influential and powerful pharmaceutical company, she and her colleague are brutally murdered. As the mystery surrounding his wife's death unfolds, Justin becomes determined to get to the bottom of her murder. He soon runs up against a drug corporation that is using Kenya's population for fraudulent testing of a tuberculosis drug ("dypraxa"). The drug has known harmful side effects, but the corporation completely disregards the well-being of its underprivileged African test subjects. Sir Bernard Pellegrin (Bill Nighy) is the head of the Africa Desk at the Foreign Office and he is the boss both of Justin and of the British High Commissioner, Sandy Woodrow (Danny Huston). In his investigations, Justin discovers that Tessa hid from him a report about the deaths caused by dypraxa, and he obtains an incriminating letter that Tessa took from Sandy. Justin confronts Sandy, who tells him that what Tessa wanted was to stop the dypraxa tests and redesign the drug. However, this would have cost millions of dollars and significantly delayed the drug, during which time other competing drugs would have surfaced. Pellegrin considered Tessa's report too damaging, and proclamied she had to be stopped. The company threatens Justin: he must stop his investigations or join his wife. In one instance, agents are sent to beat him up. Still determined, Justin takes a UN aid plane to the village where the doctor lives who provided Tessa with the clinical data behind her report. The doctor gives Justin a copy of the report, but the village is raided by armed tribesmen on horseback, and they are forced to flee from the carnage to the plane. Justin has the plane drop him off at the place where Tessa died. There he thinks about Tessa; he tells her memory that he knows all her secrets, that he understands her now, and that he is coming home. Shortly afterwards, he is killed in an organized hit. At the funeral of Tessa and Justin, Arthur Hammond (Tessa's close cousin and Justin's friend) reads the incriminating letter written by Bernard Pellegrin to Sandy Woodrow. In the letter, Pellegrin ordered the surveillance of Tessa, expressly to block her reports detailing the deaths caused by dypraxa. The company could not be held responsible for the dypraxa deaths if they never officially received the reports. The scandal having been revealed, Pellegrin leaves the ceremony followed by journalists. The film's worldwide gross was $82,466,670. Reviews have generally been very positive. On the film aggregator website, Rotten Tomatoes reported that 83% of 181 sampled critics gave the film positive reviews and that it got a rating average of 7.6 out of 10. Roger Ebert of the Chicago Sun-Times called it "one of the year's best films." USA Today noted that the film's "passion, betrayal, gorgeous cinematography, social commentary, stellar performances and clever wit puts it in a special category near perfection". However, Michael Atkinson of The Village Voice criticized the film as "a cannonballing mélange of hack-cuts, impressionistic close-ups, and tropical swelter." The film was nominated for four Academy Awards: Best Adapted Screenplay, Best Original Score, Best Film Editing, and Best Supporting Actress (Weisz). Weisz won both an Oscar and Golden Globe for her performance. The film was also nominated for two other Golden Globe Awards: Best Motion Picture (Drama), and Best Director. Additionally, Weisz won the 2005 Screen Actors Guild Award for Outstanding Performance by a Female Actor in a Supporting Role. The film was nominated for 10 BAFTA Awards, including Best Film and Best Director. It also won the award for Best Editing. The film won the award for Best Film at the London Critics Circle Film Awards, British Independent Film Awards, and Evening Standard British Film Awards. The film also received the San Diego Film Critics Society Awards. John le Carré, in his original novel, provided a dedication and also a personal afterword. Both the dedication and part of the afterword (amended) are reproduced in the closing credits of the film. The first states: "This film is dedicated to Yvette Pierpaoli and all other aid workers who lived and died giving a damn". The latter continues (in the next credit): "Nobody in this story, and no outfit or corporation, thank God, is based upon an actual person or outfit in the real world, but I can tell you this, as my journey through the pharmaceutical jungle progressed, I came to realize that, by comparison with the reality, my story was as tame as a holiday postcard". The text appears over John le Carré's name. ^ Jump up to:a b c "The Constant Gardener (2005)". Box Office Mojo. IMDb. Retrieved 7 October 2010. Jump up^ "The Constant Gardener (2005)". Rotten Tomatoes. Flixster. Retrieved 7 October 2010. Jump up^ Ebert, Roger (1 September 2005). "The Constant Gardener review". Chicago Sun-Times. Retrieved 7 October 2010. Jump up^ Atkinson, Michael (23 August 2005). "Cold Comfort Pharm". The Village Voice. Retrieved 7 October 2010.